There was heavy damage from the windstorm. Meteorologists knew it was coming for days before the record-setting windstorm whipped through the Inland Northwest. They saw the disparity in air pressure moving off the Pacific Ocean. Low pressure — typically associated with stormy weather — moved west to east toward southern British Columbia. High pressure, indicative of calm and sunny conditions, developed to the south of Washington over Oregon. They also knew about the jet stream — air moving at extremely high speeds tens of thousands of feet above our heads — and how it would push the storm across land, feeding it as it moved. And they knew about the cold front dragging close behind, another indicator of strong winds. "Wind is air trying to get from higher pressure to lower pressure," says Andrew Kalin, meteorologist with the National Weather Service office in Spokane. "So when you have a strong low pressure system, all that air wants to fill it." As the disparity in pressure moved across land, it gathered strength, which is unusual, says Nic Loyd, a meteorologist at Washington State University. Typically, mountains disrupt a storm's momentum on its way to Eastern Washington, but this time a powerful jet stream shoved it across the state, fueling the storm further. Tens of thousands remained in the dark as a winter storm warning came a week after the windstorm. "All the factors that had to come together to produce the windstorm seemed to be converging at the right time," says Loyd. "Typically [storms] are weakening when they get to us, but this one was strengthening as it moved toward Eastern Washington. That's a rarity for storms in this part of the world." 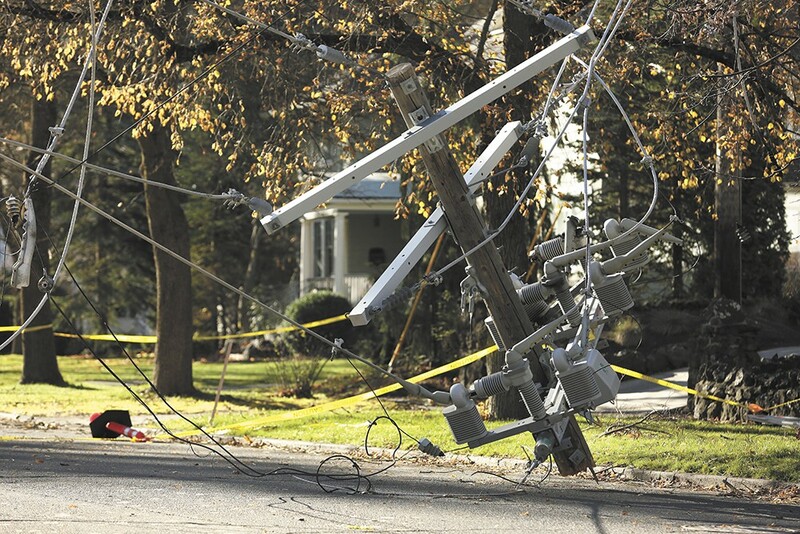 An estimated 250,000 customers initially lost power. A painting of a tree with no leaves sits on the mantel overlooking the living room. Embers blink in the fireplace below as Seamus Kinsella picks blankets and pillows up off the living room floor. He slept there, along with other family members, in the cold for the first few nights after the windstorm took his mother, Lea Anne Scott. She was killed Nov. 17 in her backyard when a tree snapped in half and fell on her. Kinsella, who lives in Portland now, grew up in the house on West 14th Avenue in Spokane. He remembers the painting above the mantel from his childhood. "Trees were a recurring theme in her work," he says of his mother, a lifelong artist. Family and friends gathered there from out of state and stayed without electricity, surrounding themselves with Scott's whimsical persona. The place is packed with her paintings and sculptures. Family photos fill a shelf in the living room, a huge stack of old newspapers yellowed with age rests on a baby grand piano and painted blue lines scribble across the back of a pair of sliding doors that lead to the dining room. The lines seem random at first, but Kinsella explains that they're actually tracings of light beaming in from the nearby window and reflecting off the door. "Whatever muse would strike her, that's what would come out," Kinsella says. "She took what she had and made it into something amazing." But Scott's presence is felt beyond the artifacts that hang from walls and sit on shelves. One could say the home itself is actually one giant piece of art. The staircase to the second floor faces a different direction than it did when Scott first bought the house, Kinsella says. Original hardwood floors and woodwork on the ceiling has been restored, and the backyard is carved into a garden that displays her work. Scott did most of that by herself. Many residents were blocked from leaving their neighborhoods by fallen debris. "It never occurred to her to contract anything out," he says. "It needed to be fixed, so she just did it." Kinsella points out each of his mother's sculptures in the backyard. One is a concrete bust of no one in particular that Kinsella says weighs a couple of hundred pounds. The others mostly are faces, with a classical Greek influence, he guesses, but they're more the result of her mood at the time she created them. Zippy, his dog who also grew up in the house, howls at squirrels and birds in the trees. The birds squawk back. That's another detail Kinsella remembers about his childhood. The family was always overrun with animals. "She could never turn away a stray," he says. "She was always rescuing something." A crow, possibly one of the birds cawing at Zippy from the trees, was one of Scott's recent rescues. She nursed it back to health when it fell into her yard, and sometimes it would come to rest on her shoulder as she worked in the garden, says her neighbor Sam Weber. "She was a soft-souled person, a pretty, sweet lady," Weber says. "Always happy-go-lucky." In between Scott's backyard garage art studio and the chicken coop in the far corner, a vase of red roses rests on pine needles next to one of her sculptures. It marks the place where she died. The spot is precisely between the place where she cared for stray animals and the place she created her art. 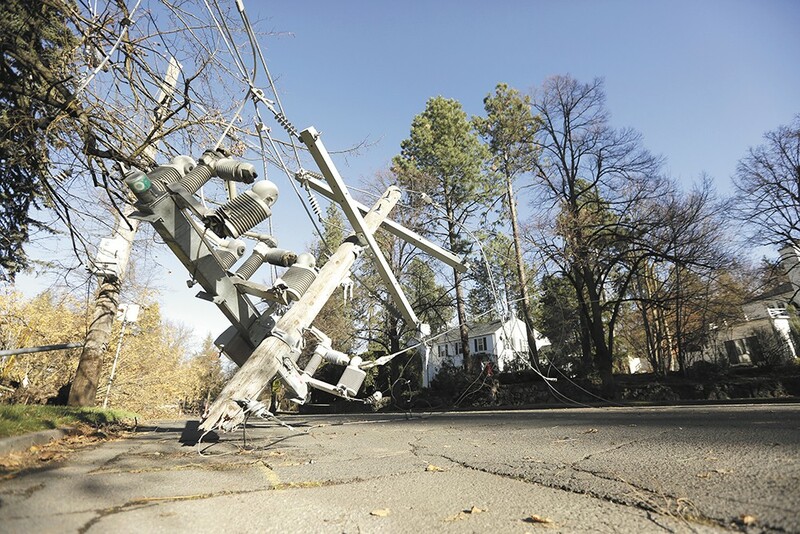 Linemen struggled to work with what Avista called a disaster of historic proportions. Avista employees knew the storm was coming several days before it hit, though they had no idea it would cause the most power outages in the company's 126-year history. On Monday morning, Nov. 16, Avista managers met to enact the emergency protocol that had developed from lessons learned during previous severe weather incidents. The protocol included stocking trucks with restoration equipment — poles, assorted wire and safety equipment — and halting any scheduled routine maintenance. They didn't want anybody on the poles when the storm hit. Some employees were trained in damage assessment. When the inevitable destruction outnumbered Avista's 28 in-house crews, assessors could speed up the restoration process by providing information about what kind of equipment would be needed at each site. Then all they could do was wait. Thousands of people began losing power Tuesday afternoon, and by 4 pm, Avista employees filed into a room with no windows for another meeting. The outage map projected onto a screen at the front of the room showed that 15,000 customers were without power. "We were thinking, 'OK, this is serious,'" says Heather Rosentrater, Avista's director of electrical engineering. The meeting lasted about an hour, and though the employees inside couldn't see the wind's effect outside, they saw it in the numbers. The outages grew to 25,000, then 80,000. By the time the meeting was over, 141,000 customers were without power, Rosentrater says. She even took a picture of the screen with her phone. Calls to local contractors, surrounding utility companies and volunteers went out for support. Calls from customers reporting trees toppling power lines kept rolling in, but crews couldn't go out until the winds died down. In all, 42 transmission lines — which carry high voltages directly from the generation source — went down, along with 23 substations, the next leg of transmission. 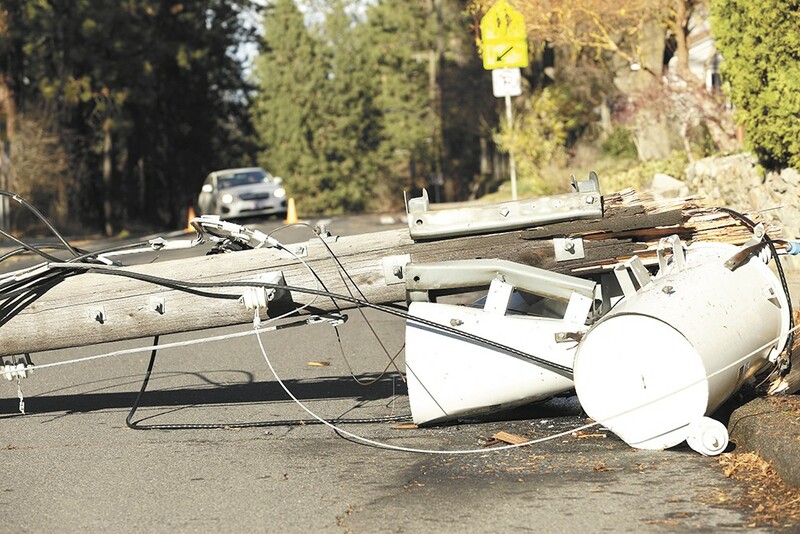 About 230,000 customers for three utility companies throughout the Inland Northwest were without electricity; 180,000 of those were Avista customers. Spokane Public Schools closed and Gonzaga, Whitworth and Eastern Washington universities all canceled classes Wednesday. About 200 trees blocked city streets. 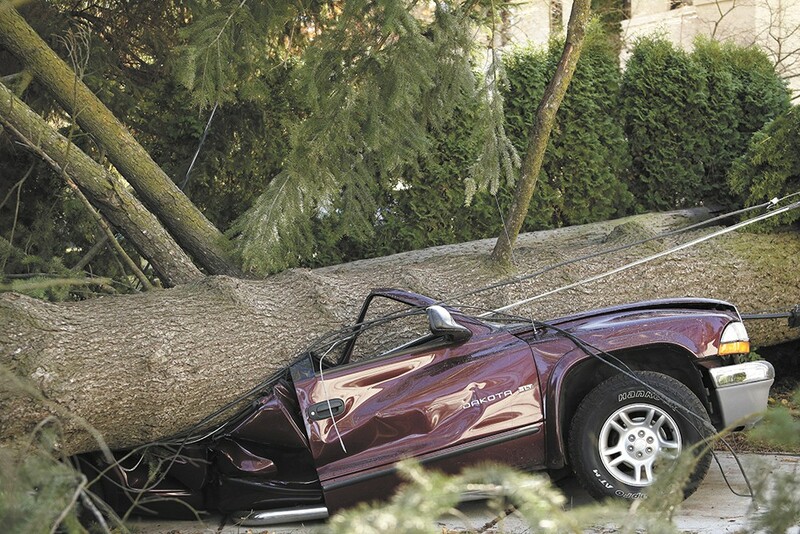 Three people in Washington state died, one man in Idaho was critically injured, and Gov. Jay Inslee declared a state of emergency statewide. The majority of the damage, authorities said, was in Spokane and Kootenai counties. By early Wednesday morning, before sunrise, Avista's crews were deployed to develop a recovery plan. The company announced that it would take three to five days to restore power to the majority of its customers. 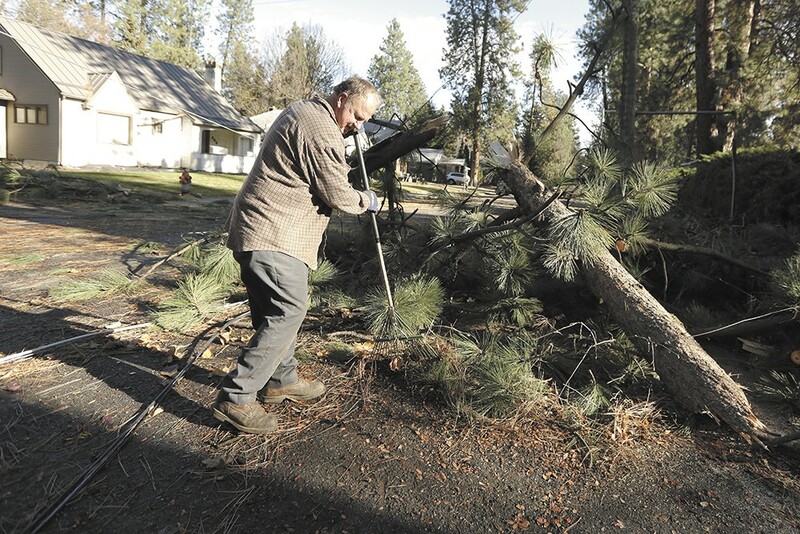 As people continued to recover from the storm nearly a week later, a total of 123 crews, including local contractors and workers from San Francisco-based Pacific Gas and Electric and Puget Sound Energy, spread out across Avista's coverage area. As of this Monday, 34,104 customers, or about 19 percent of the original 180,000, were still without power. Cleanup was still going a week after the storm. Jessie Wuerst, a spokeswoman for Avista, says the corporation doesn't know how big the total bill for power restoration will be, or if it will translate to a rate hike. "The crew costs and material costs will all be evaluated after the storm," she says. "We just don't know at this point. It's too early to tell [if rates will increase]." • The Ice Storm of 1996 (Nov. 19): Almost 20 years ago to the day, one of the region's worst storms in 60 years swept through Spokane, coating the city with a slick glaze of ice. The temperature dropped to 27 degrees (and never rose above 33) as an inch of freezing rain stuck to cars, buildings, roads, trees and power lines. 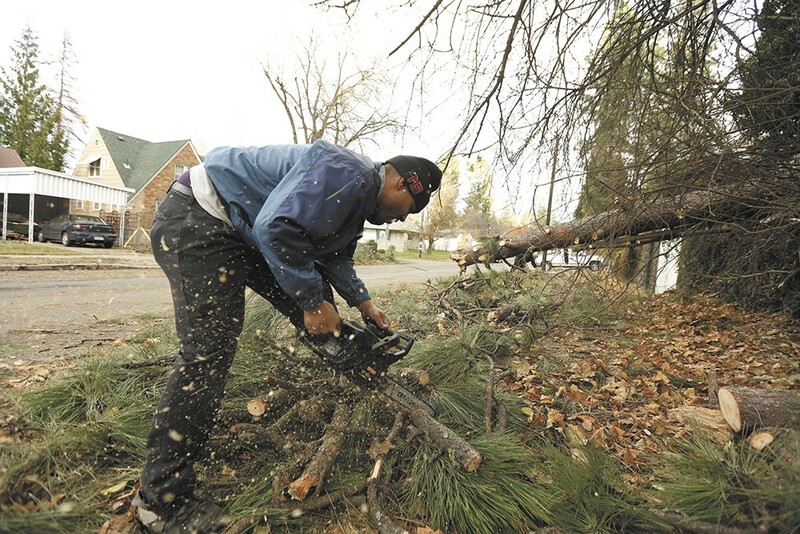 Tree branches snapped, pummeling cars and homes. Power lines buckled under the weight. Four people died throughout Spokane and Kootenai counties, and the damage was estimated at $22 million, according to the National Weather Service. More than 100,000 homes and businesses — nearly half of the entire city — lost power, some for up to two weeks.